1 Caption: Tibetan monks making a temporary sand mandala in the city hall of Kitzbuhel, Austria. 2 If you spent hours on a painting, you would probably want to keep it. You might want to frame it and put it in your room. Can you imagine spending hours on a picture and then ruining it on purpose? Tibetan Buddhist sand mandalas are intricate and beautiful. It takes hours to make them. Then, swish! They are destroyed by the artists who created them! 3 The word "mandala" comes from the ancient Sanskrit language. It means "circle." Creating sand mandalas is a Buddhist tradition. Why do monks make these detailed sand pictures and then ruin them? They believe that mandalas teach them many lessons. According to Buddhism, nothing in the physical world lasts forever. Sacred sand mandalas remind Buddhists of this teaching. 4 Mandalas contain many spiritual symbols. One type of mandala, called the Kalachakra mandala, has 722 deities in it. A deity is a divine being in Buddhism. Mandalas are meant to show people how to reach enlightenment. In Buddhism, enlightenment is the goal of spiritual practices. The creation of the mandala is also supposed to heal the people who create it and also those who see it. It is meant to clear the mind and heal the body. 5 Sand mandalas are thought to be powerful because it takes training and dedication to create them. Monks have to undergo three years of intense artistic training in order to become a mandala artist. They study the patterns of the mandalas. They learn all about the religious concepts that they symbolize. 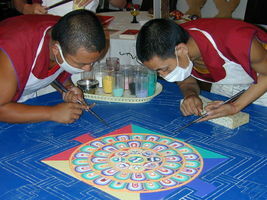 They believe that the creation of a mandala is a sacred duty. They believe that they are imparting the teachings of Buddha through their art.